The exclusive unplugged performance gave Brad the opportunity to talk about the making of the album, the inspiration behind the songs, and how a guitar, a passport and serendipity turned him into a bona fide recording artist. We were privileged to hear Brad's music and got to know him up-close. His fresh music is something to look forward to. I'm not kidding! His creativity and artistry of creating songs out of his travels, of meeting strangers along the way and talking to his muse are what this project means. Inspired by his own love story—a story that started like a fairy tale but ended without the “happily ever after”—Brad came up with a crazy idea. He would travel the world, talk to people about love and their love stories, and write songs about them. 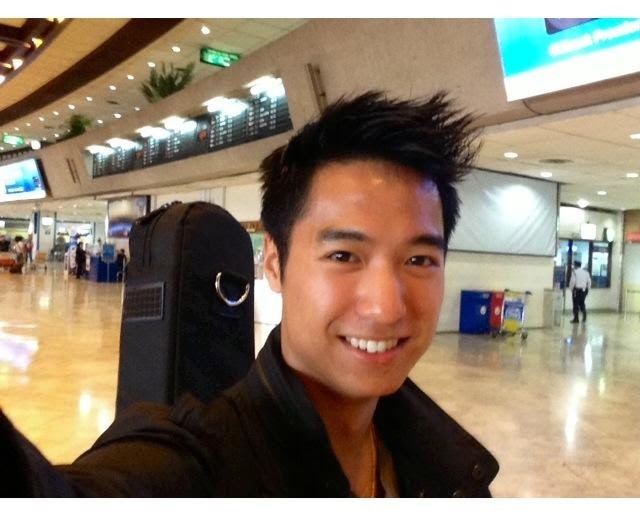 He started a Kickstarter campaign that raised over $10,000, thus giving him the opportunity to embark on his mission. “If something like this could happen to me in New York, there must be countless stories across the globe that no one has ever heard,” says the 28-year-old musician. His goal was to tell those stories. The Hush Project, on MCA Music (Universal Music Philippines), comes out February 2, 2015. The album features production by Ferdie Marquez, Eren Cannata and Brad himself. A predominantly pop rock album consisting of nine self-penned songs, each inspired by a specific place and aspect of love, The Hush Project is is the culmination of Brad's trip around the world in search of the most compelling and unique real-life love stories. Brad went to Barcelona, Tokyo, Melbourne, Singapore, Palermo, Berlin, Manila and Paris, and came back with eight (8) original compositions. The trip is documented in the form of vlogs, which are published on Brad Go's YouTube channel. The Hush Project opens with “All Along,” a veritable pop opus that plays up Brad's singer-songwriter sensibilities and musical leanings, setting the tone for the emotional roller-coaster ride that listeners are in for. This is followed by “I Want You Now,” an arena-worthy confessional that showcases Brad's lower register. Then, “It's You” starts off sparse and shifts into an anthem with the introduction of lush instrumentation while the ballad “Follow Through” builds over an acoustic guitar. Midway through the album is “Firestarter,” a change of pace that infuses guitar-based rock elements with elecropop beats. The throwback track “Feel This Way” immediately follows, recalling the dramatic piano melodies of '90s pop rock. Meanwhile, “Love Is Love” is a straightforward composition layered over synthesized finger snaps and percussion sounds. The penultimate cut is the slow-burning “Time Machine,” a stripped down singer-songwriter moment filled with heartfelt sincerity. 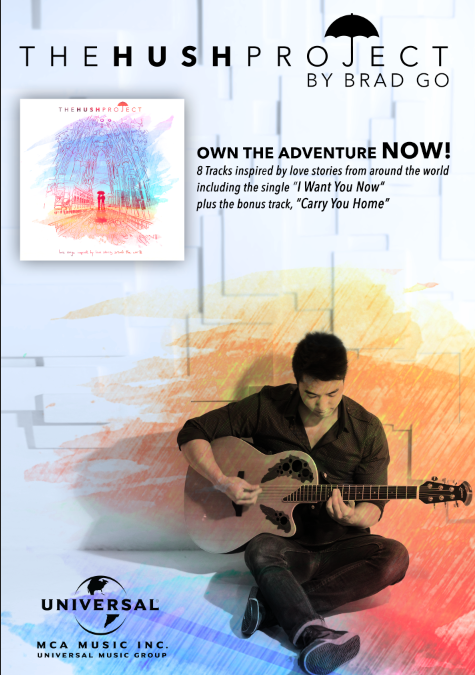 There is also the bonus track “Carry You Home”, a breezy production tailor-made for road-trip playlists that also aptly summarizes the physical and emotional journey of making the album. The album is a mix of romantic ballads, torches and mid-tempo jams that are decidedly pop rock in form, mostly structured around guitar-driven melodies and rousing progressions. The Hush Project has such an intriguing concept and fresh sound that upon hearing about it, MCA Music immediately committed to distributing the album, setting a Philippine release date of February 2, 2015. Impressed by Brad's songwriting, label executives commissioned him to write a song for another MCA artist, Darren Espanto. The result is “Makin' Moves,” which appears on the album, Darren. “‎We're so happy to welcome Brad to the MCA family. He's the complete package: He sings, writes and produces his own songs, plays different instruments, and even makes his own music videos. It's hard to find such a multifaceted artist these days. We can't wait for everyone to hear his music and see his career flourish here in the Philippines and abroad,” enthuses MCA Music domestic label marketing manager Mark Bonifacio. “Brad is a very marketable artist. He's showing a lot of potential and we at MCA are looking forward to helping him cultivate and grow his personal brand as a recording artist, musician and songwriter. The Hush Project is just the first step,” adds MCA Music artists and repertoire (A&R) manager Francis Guevarra. 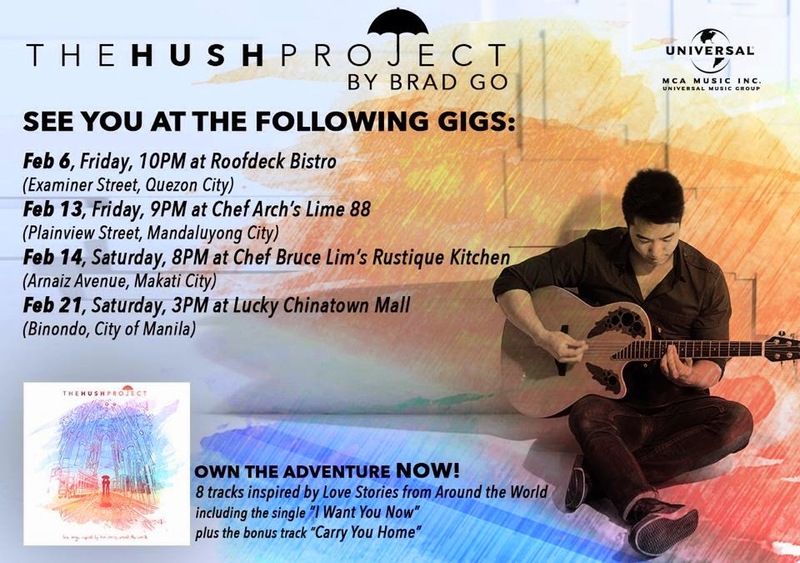 Brad is scheduled to perform at the Roofdeck Bistro (Examiner St., Quezon City) on February 6 (10 p.m.), Chef Arch's Lime 88 (Plainview, Mandaluyong City) on February 13 (9 p.m.), Bruce Lim's Rustique Kitchen (Arnaiz Ave., Makati City) on February 14 (7 p.m.), and Lucky Chinatown Mall on February 21 (3 p.m.). Catch Brad live on Energy FM 106.7's Eat All You Ken on February 10 (6 to 9 a.m.) and Mellow 94.7's The Wake Up Show on February 11 (8 to 10 a.m.). He previously appeared on Wave 89.1's Funny Side Up on January 30. The Hush Project is available at Astro Plus and Odyssey record bars and online at iTunes, Spinnr, Deezer and Spotify. For more information, please go to hushproject.tv.